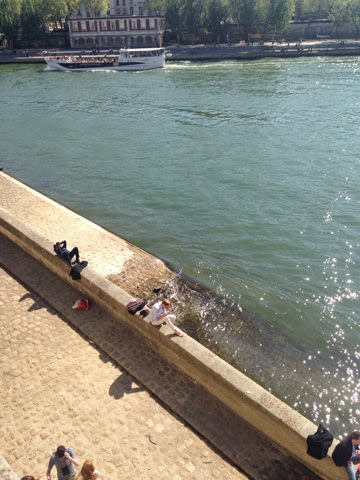 So I'm stood with my back to the hot sun looking on at Ile Saint Louis. Is it just because I am so interested in sweet things that I seriously believe this island to be wholly devoted to the famous Berthillon ice cream? I think not. 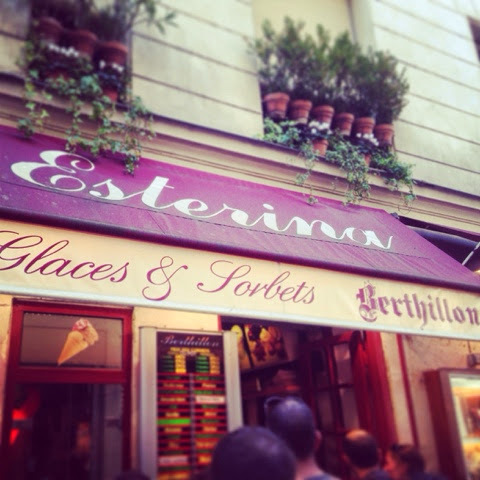 Every brasserie and restaurant which surround the small ice cream parlour serves Berthillon. 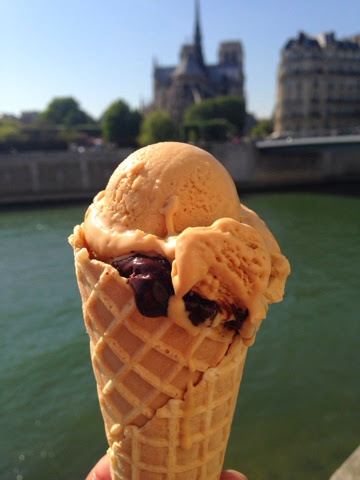 It is the only ice cream to be able to fight for France against the Italians, who are, and allow me to bow my head in all humble respect, the Best at ice cream, aka gelato. Fact. My uncle is a huge fan of Berthillon and only last week was he saying how price-wise, it is a lot better to buy Berthillon by the tub rather than by the scoop. I'm not sure what he meant by that. I think he meant that he likes to sit and eat tubs of Berthillon ice cream. Me: "You mean, its cheaper?" him: "Well, not really." I didn't question further. 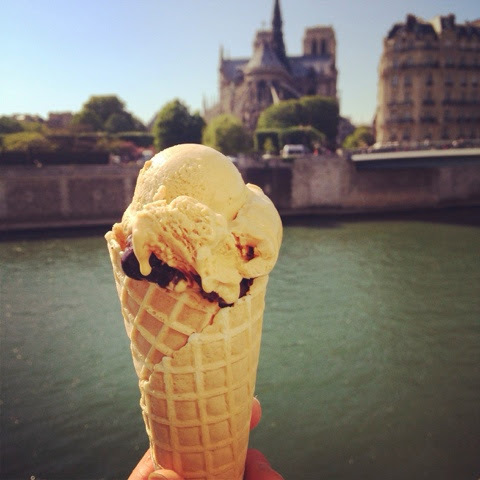 Ice cream seems to be the only socially acceptable snack to have in the streets on a bright sunny day. 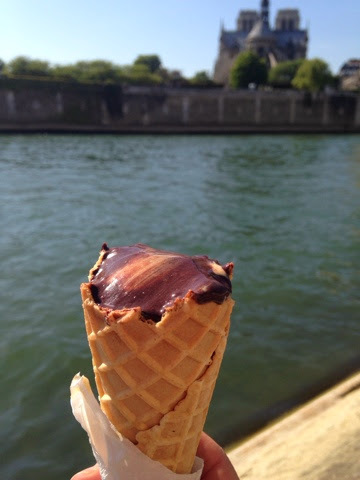 Let me explain: the French are weird about snacking and grazing. Noone ever does it pubicly, a little bit like smoking indoors or something. It's just not cool. Today I tried the salted caramel butter and bitter cacao. Funny how even when I want something fruity I just will never ever allow myself to have it. I think its something deep inside of me, an experience from my childhood, either traumatic or not, that makes me always get chocolate. ALWAYS. But I don't think I'm alone..? Last little ramble, I think that Berthillon stole his recipes from an Italian master. Three reasons for this: one, noone and I mean noone can make gelato like the italians. Second, Berthillon is banging. 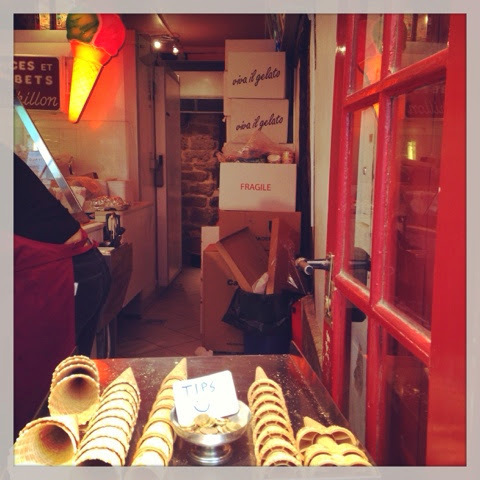 (London- lingo for bloody delicious) and third, I can see boxes in the shop with the writing "viva il gelato" and "fragile" which means that something is being imported from il Bel Paese in the production of this artisanal delicacy. Further Investigations to be held. 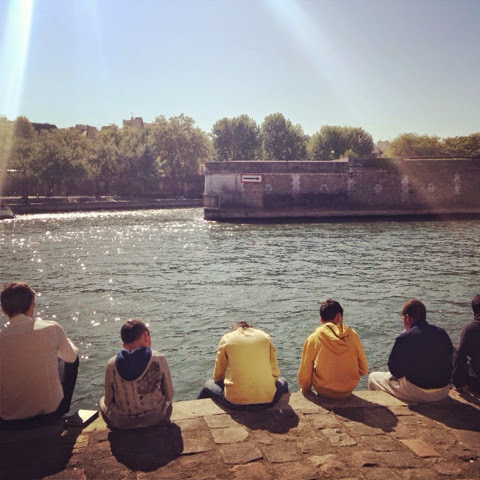 Posted on April 17, 2014 by Abigail Scheuer- Sarne and filed under paris and tagged recommendation inspiration2.